A Selection of Striders Post Race, Savouring the Atomic Atmosphere. 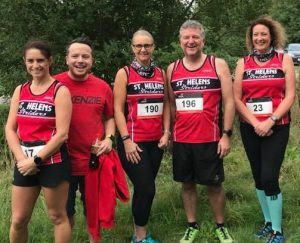 The St Helens Striders are not your average running club! 34 athletes made the trip to Palma De Mallorca. An inclusive body of runners that have inspired great friendships. The Striders welcome those who wish to get involved for a truly unique experience! 7000 athletes from across the globe took part in the 3 varying distances. 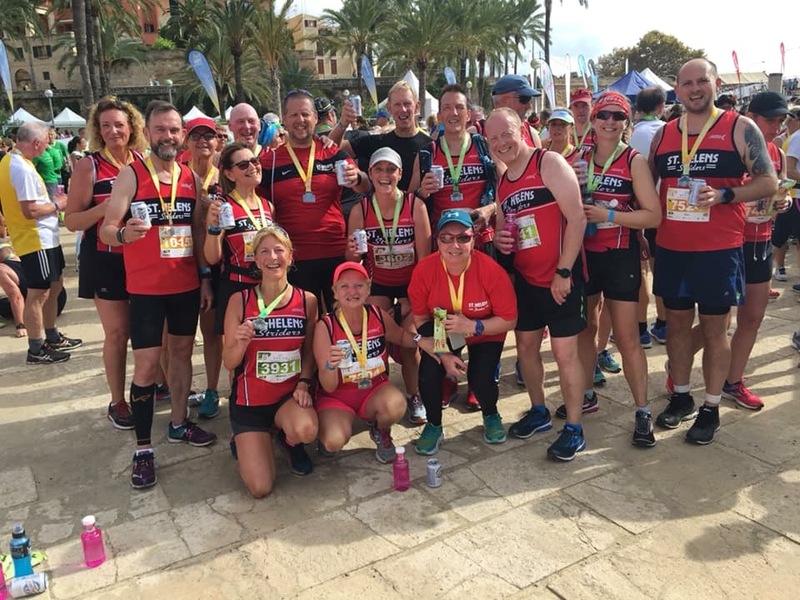 In the Palma 10k Gary Eccleston was the first Strider to cross the line in 55:35. There too were great efforts from Zoe and Mark Fillingham, Jackie and John Dobson. Brenda Carrier and Sue Burke supported one another all the way completing the course in 1:24. Nicola Donovan finished in 58:34. 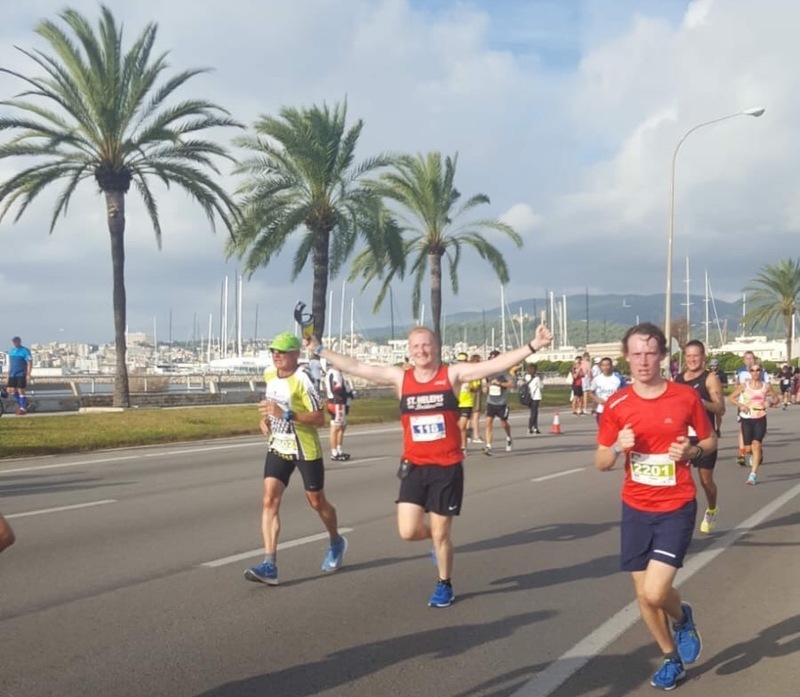 In the Palma Half Marathon Jon-Jo Doherty came home in 8th place overall in 1:16:50. David Navis never gave up, and although the heat took its toll he finished strongly in 1:55:52. Mark Carrier after 8 months of injury came back strong to succeed all expectations in 2:01:45. Peter Bennett applied himself well, finishing strongly in 2:09:32. Colin Wilson and Jane Marshall forged a great partnership which saw them hold out to the finish line. 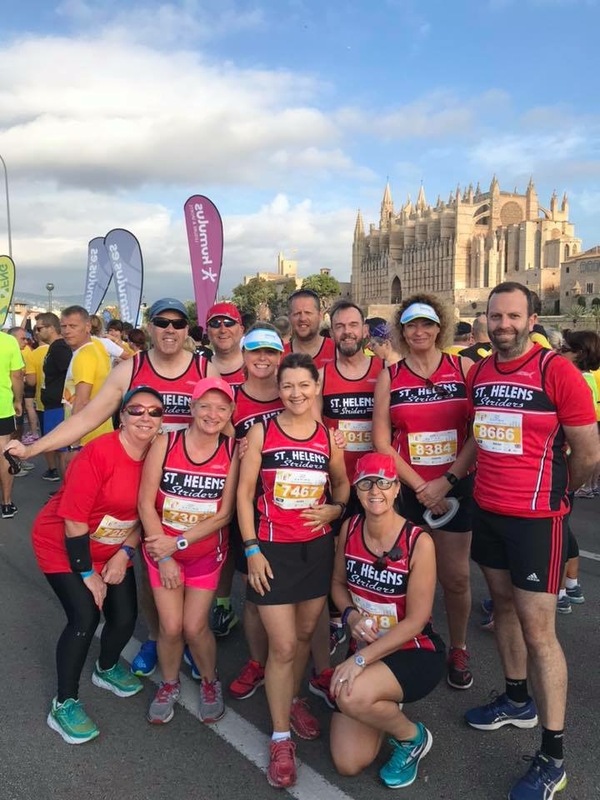 Paul Booth took on the Palma Marathon, he’s well known for his endurance abilities and his never say die attitude, and with avid determination secured a time of 4:01:39. Kelly Hamilton again inspired her fellow teammates finishing as third lady overall. She dug in and at one point fell flat on her face and lost her shoe! Rachel Fairclough by no means a stick in the mud, and after recently giving birth to her first child decided that this was the race to make her comeback! She excelled brilliantly running alongside her husband Peter, and moves into the cross country season with even greater determination. Mark Hamilton stuck to his guns producing arguably his best performance of late. He managed to pass quite a number of athletes just before the final straight! Tony Dagnall smashed his personal best in the Manchester Half Marathon in 1:40:37. Lynda Butchard made further ground, and by improving on a seasons best by over 7 minutes, securing 2 hours 17 minutes. Scott Barlow can now be seen as a force to be reckoned with, securing further progress in 1:40:41. Tom Chadwick dazzled with an impressive display, destroying his previous best by over 9 minutes in 1:34:14. And finally Joe Weaver also delivered, with a stunning improvement in 1:32:08. In the Alder Hey 10k Jenny Martin redoubled her efforts, and with unrivalled discipline won 1st veteran prize over 35! Eric Ranson, Gillian Kelly and Kevin Cairns also impressed showing great fortitude and exacting team spirit. 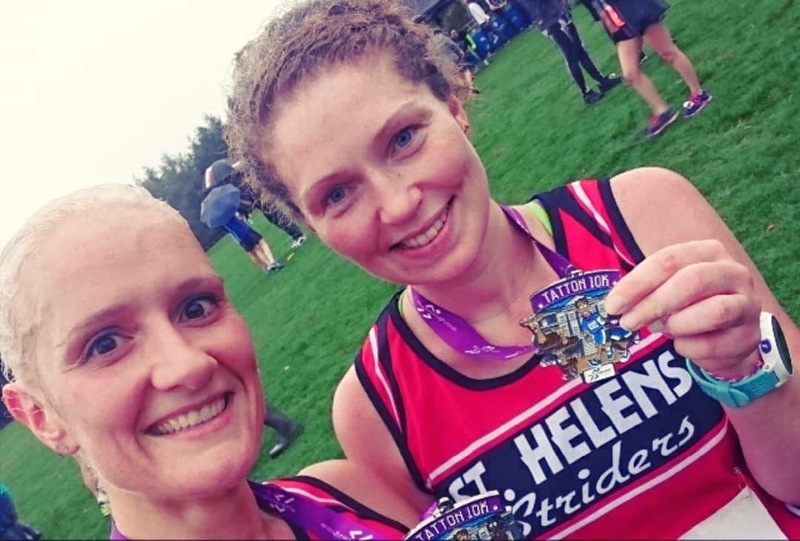 And elsewhere in the Tatton Park 10k, Kerry Riley romped home with a new personal best 53:41, her longstanding teammate Katie Taggart was with her every step of the way in 53:37. Chums Katie Taggart left with Kerry Riley right. 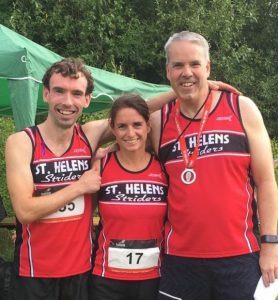 It was another weekend of successes both at home and abroad for St. Helens Striders. 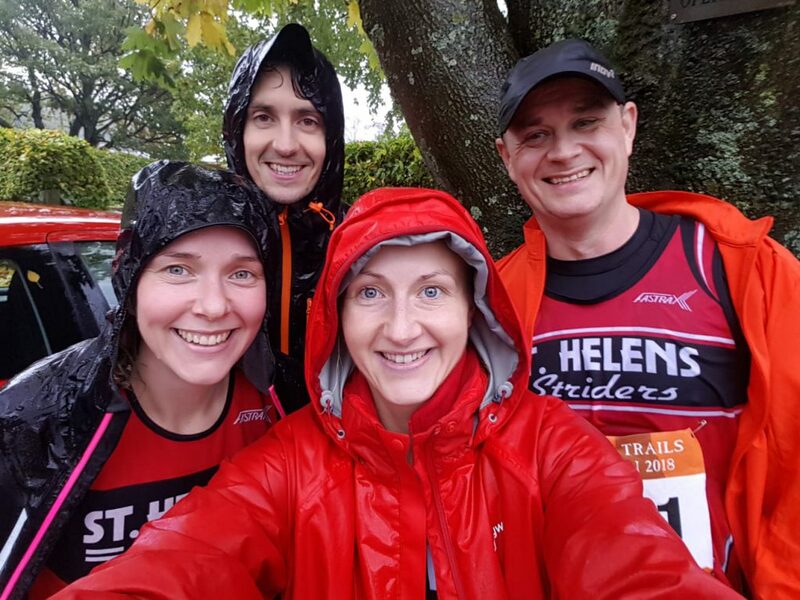 The EHM Festival in nearby Warrington produced a string of fine performances across three tough courses, despite the inclement weather conditions. In the 5km race, Martin Ballard secured an impressive top 10 finish in a time of 20:51. In the 10km event, Zoe Fillingham set a 2nd PB in as many weeks coming home in 57:52. There were also new PBs for Gary Eccleston (53:47) and Nicky Donovan (53:08). Daniel Tetlow (44:14) and Susan Kerfoot (47:22) also produced performances of note. Kelly Hamilton adopted the role of 45-minute pacer to push competitors to their target time and did so in typically enthusiastic fashion. The main event, the half marathon, saw PBs tumble with impressive regularity. Chris Reid crossed the finish line at the historic Golden Gates in a blistering 1:36 to secure a new best at the 13.1-mile distance. Anthony Ellis was hot on his heels with his own PB of 1:37 while Karl Bowles, in his first outing in the red and black, showed his promise with a superb time of 1:40. Tony Horsfall continued his fine form, crossing the line in 1:43; a time matched by the indefatigable Claire Scott. Kevin Winstanley continued his comeback trail with a determined 2:23, taking 20 minutes off his previous half marathon time. 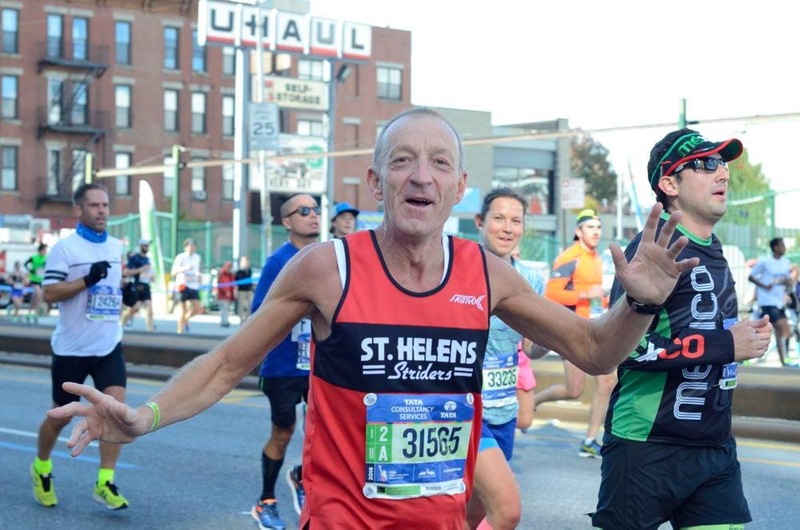 After a 4-year hiatus at this distance, Steve Conway delighted his admirers with a dogged 2:17. 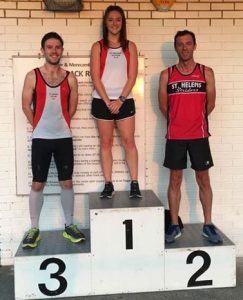 There were astounding improvements from both Jane Marshall, who lowered her previous best by 4 minutes in setting a time of 2:05, and Colin Wilson, who celebrated his recent ‘Strider of the Month’ award with a breath-taking 8-minute PB of 1:43. 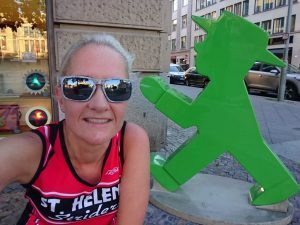 The intrepid Katie Taggart and Pete Medlicott formed a squadron to fly to Berlin to take part in the city’s marathon. It was a historic day as Kenyan Eliud Kipchoge demolished the marathon World Record on the streets of the handsome German capital. Equally impressive, however, was Medlicott’s first sub-4-hour clocking over 26.2 miles at the 11th attempt. 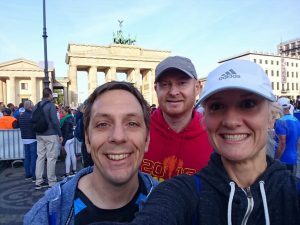 He avoided hitting the wall and blazed through the finish line at the iconic Brandenburg Gate in 3:56. Taggart also completed the course, taking the opportunity to savour the sights as she cantered with consummate ease to the applause of the exuberant German crowds. 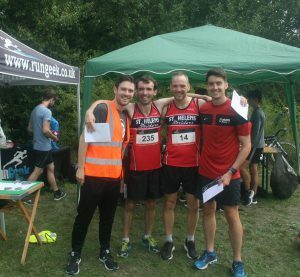 Team Prize; from left to right with Run Geek’s Mathew Crehan, Jon-Jo Doherty, Daniel Cheetham and Peter Fairclough. St Helens Sutton AC put on a fabulous two part event, with Mathew Crehan’s Run Geek as the main Sponsor. It was the 5k first with Jon-Jo Doherty scooping the main prize. The Striders also gained Team Prize with Ann Johnson and Mark Fillingham. Doherty followed up his victory with another powerhouse performance in the 10k. And again the Striders gained Team prize with Peter Fairclough and Daniel Cheetham. 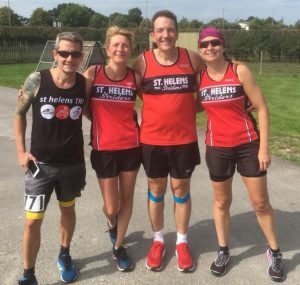 It became a St Helens Striders clean sweep! In the previous mornings Halewood 5k there were PB’s for Mark and Zoe Fillingham 23:52 and 28:11 respectively. An impressive first sub 20min 5k for Anthony Ellis with 19:44. Darren Eckersley returned to the fray with 20:53. Jon-Jo Doherty regained his club record with a time of 16:10, and first Lady whizz kid Kelly Hamilton scored 19:07. Nicky Donovan enjoyed a PB with 25:36, and her very much devoted Gary Eccleston pushed her on with a time of 25:10. A team photo which encapsulates the Strider team spirit! In Lancaster on Friday evening, rookie Kane Green on his first official outing for the Striders established himself as a force to be reckoned with! He created a New Club Record, and that although short lived was nonetheless magnificent in a time of 16:18. Rookie Kane Green on his phenomenal debut! 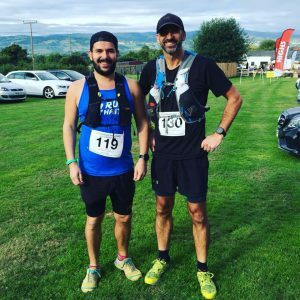 The Clwydian 15 Mile Race praised for its variety and scenic challenging nature, involves a considerable ascent at just a touch over 3600 feet. But It was never going to stop Striders front man Ian Wright, who secured himself 7th place with an heroic effort of significant importance. In the Trafford 10k Sian Maguire delighted her sister Kylie with a PB of 49:43. Kylie finished well with a time of 44:28. Also in the La Manga 7k Carol Foster finished 3rd Lady in the veterans category. This event is held in Spain, within the region of Murcia and travels through luscious rolling green lawns and hillside lakes. More Strider team Spirit before the Dream Trail! 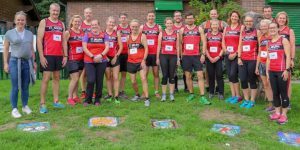 The South Cheshire 20 miler: this race which has always been avidly supported, contains hilly terrain that borders country lanes and picturesque scenery. David Briscoe, Sharon O’Connell, Joanne Jackson and Neil Hunter raised their game to new heights, and working as a team they produced an all round display of camaraderie and jovial wonder.